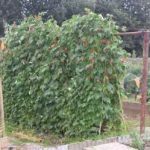 Runner Beans – one of the most productive crops per square foot you can grow. Peas were one of the earliest crops cultivated and are pretty much still a staple of the western diet. The entire family of legumes is important in that they provide a valuable source of protein and in a rotation help add valuable nutrient to the soil. On the roots of legumes are small nodules in which live bacteria that have the ability to fix nitrogen from the air. This in turn feeds the plant so helping the bacteria. 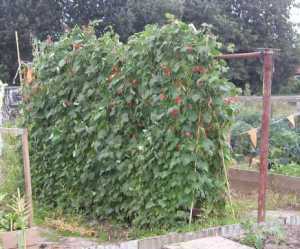 Last year we grew 4 teepees of runner beans on Plot 29, Bed1. They provided about twice what we needed so this year just 2 teepees of runner beans. I am also going to try growing climbing French beans so that’s back to 4 teepees. Effectively a 14’ square. Dwarf French beans were pretty spotty last year, back to the bad weather. Peas did fairly well but I grew a tall growing variety and the netting I set up to hold them blew over. Stronger supports this year. 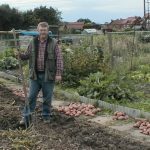 Broad Beans – I don’t know why but I always seem to do OK with broad beans. I don’t bother with autumn sowings. 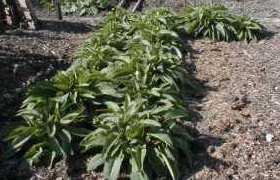 Not really found much benefit as wet winters wipe them out so I stick with a fairly early sowing in late February or early March. 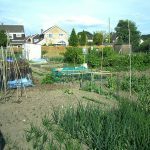 I think the broad beans will go onto plot 5 and I’ll use Bed 2 on plot 29 for the climbing beans and peas. I know these will be following on from field beans but I don’t think it will do any harm this once.